We’re not talking WWII, or even WWI. Or even the Spanish-American War. 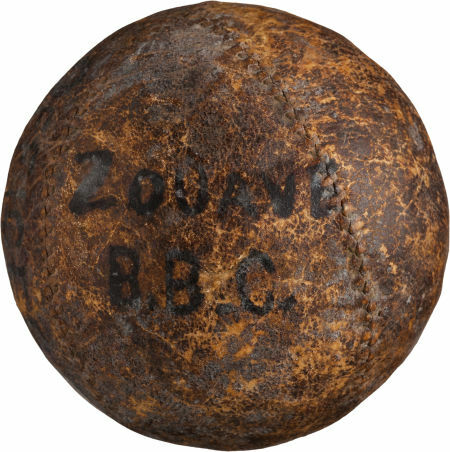 This ball was in Sherman’s march to Atlanta, in 1864. Written on it is Zouave B.B.C. [which must mean Base Ball Club]. 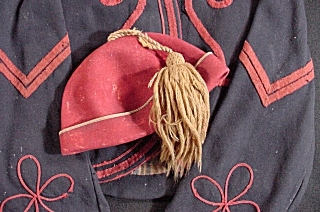 The Zouave units in the Civil War were modeled after the French elite Zouave units, which were first formed in Algeria, from native tribesmen. There were numerous volunteer Zouave units on both sides of the Civil War, and initially at least some of these units practiced light infantry tactics. They often wore eye-catching (and bullet-attracting) uniforms, with baggy red pants, short open jackets, and, at times, fezzes. In any case, this old baseball is up for auction. Interested? Details here. It will be interesting to see what this goes for. Nice to see the Twins win a few now, after their 10 game losing streak. Tonight the Twins wore the uniforms of the ’48 St. Paul Saints, and won again, 8-6, hitting four home runs. 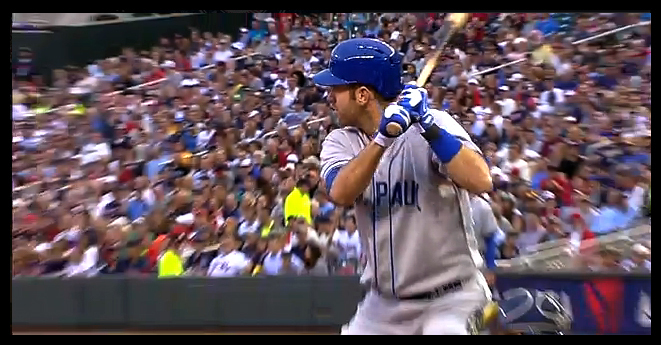 Here’s St. Paul’s own Joe Mauer, just before he hits his home run. I read an article somewhere recently, (maybe the Star Tribune?) about how the Saints and the Twins were trying to be friends now, after a history of antagonism, starting when the latest version of the Saints started playing ball over their at Midway. For the first time the Twins have a player on the active roster who has played with the Saints, Northfield’s own Caleb Thielbar. Looks like the kid throws strikes. Came across this article in the NY Times this morning, from Saturday’s paper, about how Topps has seemingly altered their secret and unacknowledged numbering “system,” which apparently has assigned the number one card and the “double zero” (such as 100, 200, etc.) cards to “superior” players. For example, in 1969, some of the players with “double zero” were Hank Aaron, Mickey Mantle, Bob Gibson, and Tony Oliva. So, even though Topps has never said that there’s a system, sharp-eyed card collectors knew there was. And so, if you were wondering if Tom Seaver was any good, one look at the back of his 1970 card would show you that he was #300, and so you would know, yes, Tom Seaver is a pretty good pitcher. Got it? Yes — down this road lies chaos. I’m not sure baseball will survive this scandal. But then, I don’t know if their numbering system was ever a very valuable tool. I suppose, if you knew nothing about baseball and were collecting baseball cards, it would be helpful. But perhaps, now, that safety net is gone. Because baseball cards are in the news, I will slap one of my old cards up here. 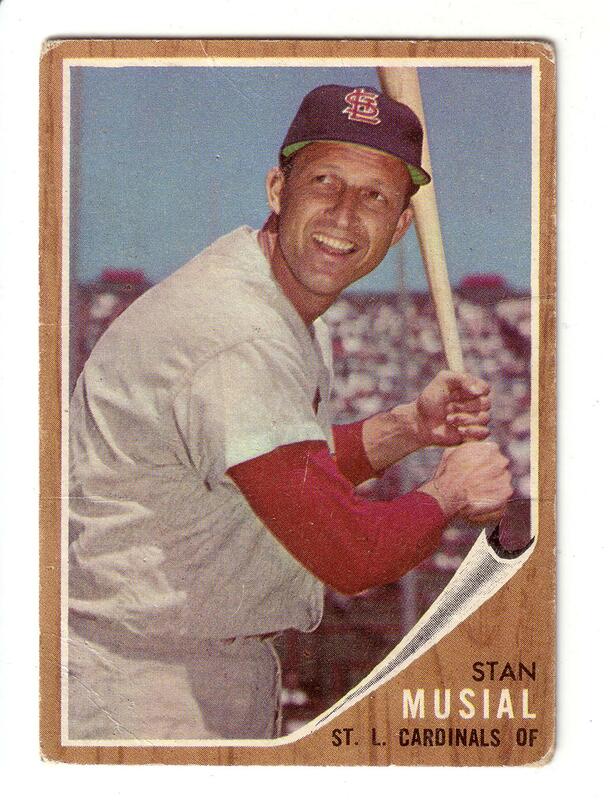 Stan Musial died this year, and I was surprised to find out that I had a Stan Musial card in my collection. This is a 1962 card. I’ve always liked that year’s design, with the faux wood background. 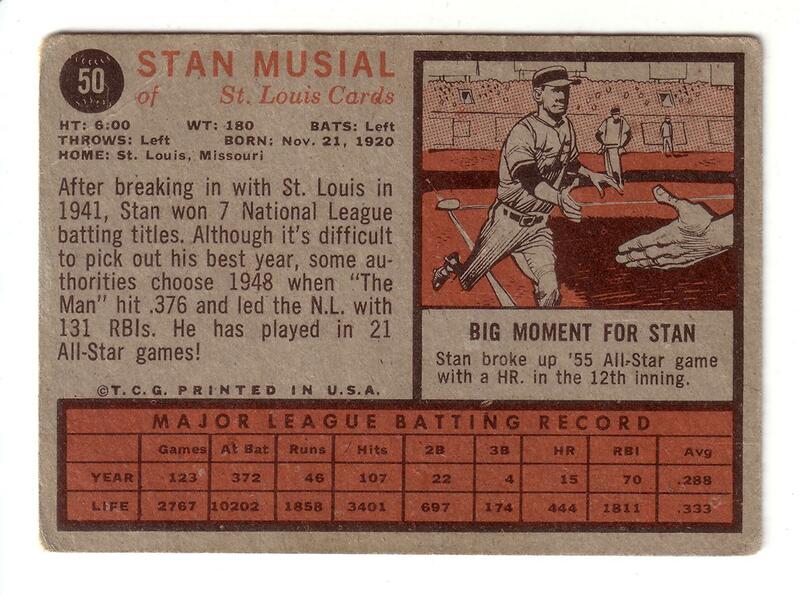 You’ll note that he was card number 50 that year; perhaps Mr. Musial was a minor star of some sort, certainly not “double zero” worthy, but perhaps a well-known player to certain astute St. L. Cardinal fans. The drawing on the back seems to be of some other player, though. Doesn’t look much like Stan at all. I like the big hand coming out to greet “Stan” as he approaches the plate — almost as if it’s your hand, welcoming Stan home, to your collection. whatever you say, Mr Kluszewski, sir. 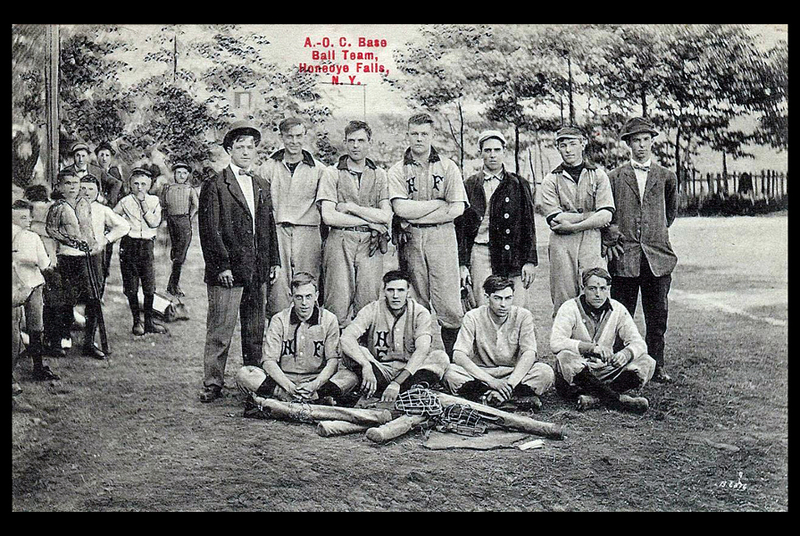 Okay, here’s another of my favorite old baseball cards. Ted looks like a guy you did not ever want to get angry. Did the Redlegs ever play a game with sleeveless jerseys? Or is this just Ted being Ted? I suppose if Ted didn’t want to wear the under shirt, no one was going to say anything about it. Whatever you want to do, Ted. Er, Mr. Kluszewski. Sir. It’s a good look for you. 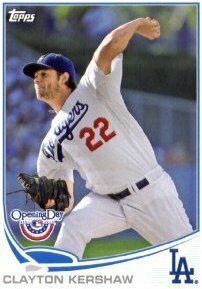 The card’s a little off-center, I suppose that decreases its value a bit. Oh, and there’s that big crease in it, too. Kind of makes it impossible to know for sure how many triples Mr. Kluszewski hit in ’47, ’48, and ’49. And I guess the corners are not quite perfectly square, really. Still. It’s kinda priceless, I think. Also, a pretty good baseball name. 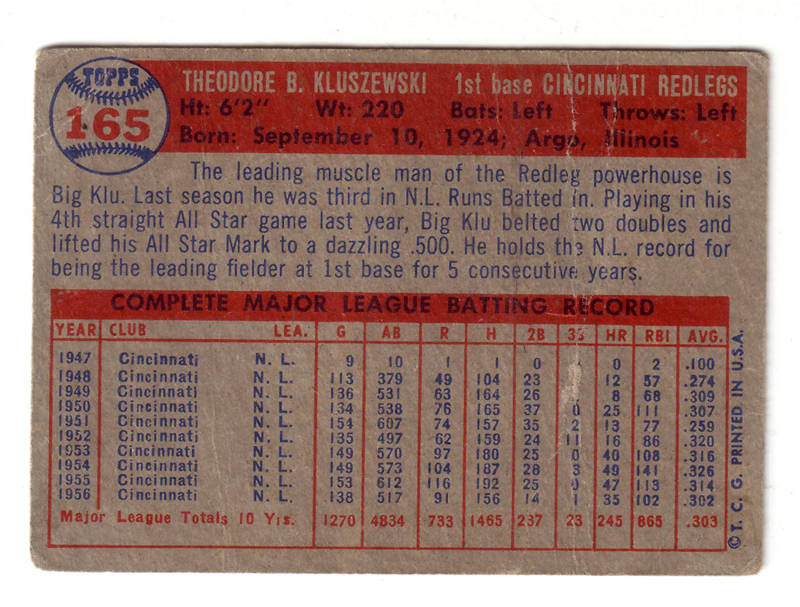 Kluszewski was named to the National League All-Star roster 1953 through 1956, and was a career .298 hitter with 279 home runs and 1028 RBI in 1718 games. 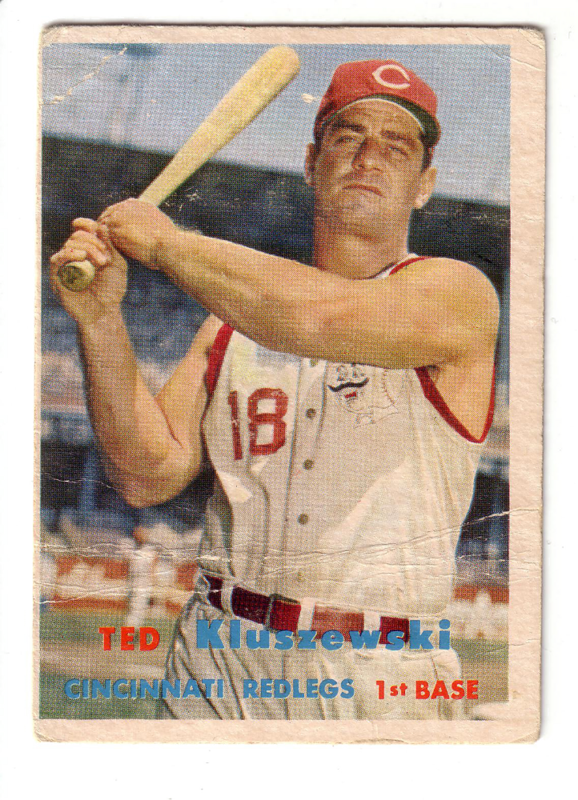 In ten of his fifteen seasons, Kluszewski walked (492) more often than he struck out (365). In 1955, he hit 47 homers while striking out only 40 times. No player since him has hit 40 homers and struck out 40 or fewer times in the same season. I note that they don’t say anything like “as nice as he was big” or “known for being a gentle giant with a heart of gold.” Probably he was, though, at times. What we have here is a Japanese baseball jersey, on sale at Ragstock in Minneapolis. They had quite a number of them, and all of them looked like they had seen hard action. Plus they were all very small. I’m not a big guy, and these things would be way small on me. High School jerseys? In addition, they were made out of some space age material. Double-knit naugahyde? So far, I have not turned up a Kubara baseball team. I’ll keep you posted though.